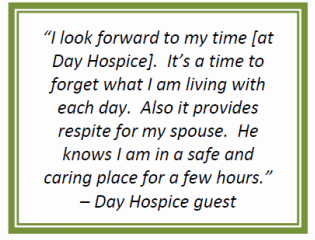 Compassion and comfort is the focus of Hospice Care Ottawa. Our services are provided at no charge. We offer emotional and social support to individuals facing a life-limiting illness and living at home through our Day Hospice and In-Home Support programs. When being at home is no longer possible, Hospice Care Ottawa provides 24 hour care in a home-like and peaceful environment. Bereavement Care is also available to those who are coping with a loss. ﻿Delivery of services is made possible through the support of a small dedicated staff, many trained volunteers and generous donors. We currently have three hospice sites to serve the Ottawa region.